Find lost passwords to Windows 10, Windows 8, Windows 7, etc. Lost your Windows password? Don't panic, the world is not coming to an end. The Windows log-on password is one of the most important passwords we have memorized and if you've lost this password, the entire world can seem just out of reach. Most of the methods listed below to find lost passwords apply to Windows 10, Windows 8, Windows 7, Windows Vista, and Windows XP. Some of these ideas might work for older Windows operating systems as well. The quickest and easiest way to get back into Windows after losing your password is to reset it online...but only if you have Windows 10 or Windows 8 and only if you use a Microsoft account to log in. If that doesn't describe your situation, move on to the next idea. Since you use your Microsoft account as your Windows 10/8 credentials, and since Microsoft manages those accounts online, you can easily reset your lost Windows 10 or Windows 8 password from any browser, on any computer or device, including your smartphone. Not sure if you log in to Windows with a Microsoft account? If you log in with an email address, then you're using a Microsoft account. If you log in with something other than an email address, like your name or some other handle, then you're using a local account and this method won't work. If you don't use Windows 10 or Windows 8, or do but log in with a local account, the easiest way to get out of a "lost Windows password" predicament is to use your password reset disk—assuming, of course, you have one. You'll know if you do. Creating a password reset disk, which can actually be a flash drive or a floppy disk, depending on your version of Windows, is something you have to do before you lose your Windows password, not after. So, as is probably obvious, this option isn't going to do you any good if you never created one yourself before losing access to Windows. 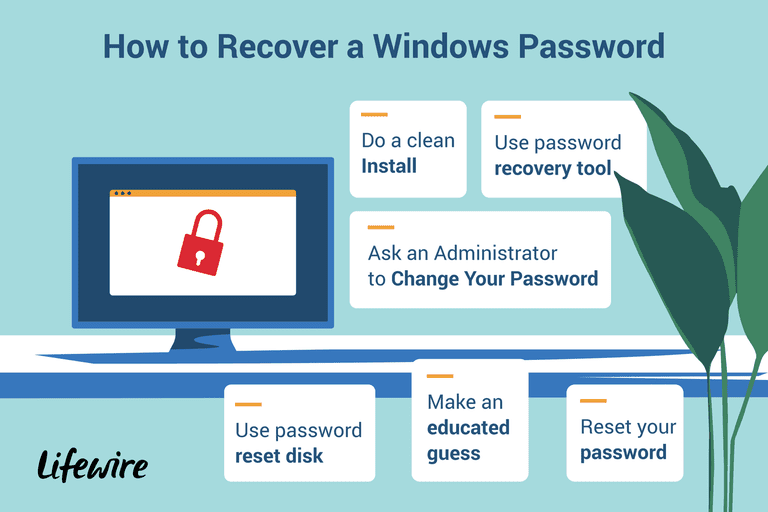 However, once you do find your lost Windows password, as we're sure you will with one of the other methods below, come right back here and learn how to create a password reset disk so you can avoid all this trouble next time. You only have to make a password reset disk once. No matter how many times you change your password after creating the disk, it will still work to reset your lost password. The next easiest way to find a lost Windows password is to forget the idea of finding it at all! Just have one of the other users on your computer change your lost password for you. This will only work if one of the other people you share your computer with has a Windows log-on account that's set up with administrator level access. One account usually is, so be sure to give this a try with as many accounts as you can. The first account that was set up in Windows is often times set up with administrator access. Obviously, you'll have to pass on this idea entirely if you're the only user on your computer. Don't laugh! We know this might seem like obvious advice and something we're sure you think you've done already. Your first reaction to a lost password was probably to "think really hard," and that didn't work. The trick here is to make an educated guess. Most passwords, even complicated and well-designed ones, are inspired by the people, places, and things in the account holder's life. For example, could your lost Windows password have had something to do with a loved one's birthday, a pet's name, an often dialed telephone number, etc.? See the link above for tons of great ideas to get your wheels turning. Hacking into Windows might sound dangerous, illegal, and too complicated, but the reality is quite the opposite. In most cases where the ideas above aren't options, a Windows password recovery program is the successful strategy. These password recovery programs are completely safe and easy to use, even for a computer novice, as long as you can follow some step-by-step directions. If downloading unfamiliar software, burning discs, or mastering flash drives doesn't sound like things you're interested in, give this a try. You'll have to do a little command-line work but all you'll need is access to your Windows installation or recovery media...and a little patience. On the other hand, the automatic password reset and recovery tools, which we just mentioned in No. 5 above, are probably going to be faster solutions from start-to-finish for most of you, than using this method. This is the option you really don't want to try but we include it here because it's a certain fix for a Windows lost password problem. A clean install of Windows is a complete erasure of your hard drive, followed by a reinstallation of the Windows operating system. We have some great step-by-step tutorials linked below but the clean install process is time-consuming and you lose everything in the process. If you skipped the previous two ideas above because they sounded too complicated, please know that a clean install is much more involved.